Exposure to the sun, rain, and dirt is enough to make your vehicle’s finish look less than shiny. While owners will try all types washing services their vehicle’s body may have lost its luster. Instead of trying to scrub away the fading shine, get the experts at NCA Auto Body Repair to slap on a fresh coat of paint. Our specialists use the most advanced equipment and skills to provide precision paint services. Every paint service pays close attention to detail and gives your vehicle the glossy look you had the day you drove it off the dealer’s lot. Ultimately our technicians are here to return your vehicle to its “glory days.” Time, weather, and wear-and-tear will do a number on your vehicle’s paint job. We’re here to provide the top quality, and affordable auto painting services that you’ve been wanting. Quality Auto Painting Services–Finishing Touches Are the Best! The bodywork we provide is always at the industry’s highest standard. When your vehicle is in a collision, you should come to us first because we want what you want. The same thing goes for any of your vehicle’s auto painting services. Not only do you want your vehicle to be shaped like you remember, but you want it to look like you remember too. 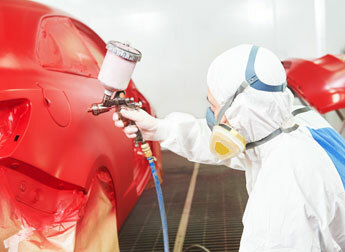 Our expert paint repair techs will maintain your vehicle’s original color. Or maybe you want to switch it up this time. We’ll make sure you drive away happy with the auto body paint job that you wanted. We’re not sloppy and we’re not in a hurry, but we don’t waste your time either. NCA Auto Body Repair knows that we’re usually an expected pit stop. You spend half your life out there on the open road. But you’re driving an attractive, fully-functioning vehicle. Our shop goes above and beyond to make your auto body repair and paint services as convenient and quick as possible. Schedule Your Auto Painting Service Today! Your vehicle’s exterior is your initial impression to everyone else on the highway. It’s similar to your clothing. The same way you wouldn’t put up with a hole in your favorite outfit, you shouldn’t put up with an unattractive paint job. Whether it’s as a result of a minor or major impact, or a fading paint job, we have the answers. Give us a call today at 603-668-1768 to schedule your auto painting service. We’ll guide you through the entire painting process which will make your car look like you just bought it. Next time you’re in the area, feel free to stop by. We gladly accept all of our walk-ins!